Like many other afternoon, I thought of spending a few minutes on Reddit, a way for me to justify that I’m still being productive chiming in on topics about finance. Then I was startled to read that Amazon.ca Rewards Visa Card was shutting down. It was my first credit card that gives while I spend. But there’s more to it than getting points and I need to find a new credit card fast. It’s hard to find a credit card that doesn’t charge foreign transaction fee and with no annual fee. An alternative in mind is Rogers Platinum Mastercard. Though it charges foreign transaction fee, you also earn cash back at the same time. So you basically don’t pay anything and still gain a bit through cash back. Pay for international online shopping. Pay for Pag-IBIG contribution online. Use as main credit card in travelling. The thread on Reddit led me to Home Trust which I haven’t heard before. I was ecstatic that it is also a Visa credit card just like the Amazon.ca Rewards Visa. Most of the credit cards in Canada are Mastercards. I don’t know much of the difference but it’s good to have back up especially while travelling. The reviews of Personal Finance Bloggers in Canada about Home Trust are enough for me to decide to give it a go. And I don’t have much choice because Home Trust is the only card that fits my criteria. I’m not going into details of what Home Trust is since the other PF bloggers have made amazing post about it. My goal is to write about my experience in using the card for a few months, so you can decide if Home Trust Preferred Visa is the right choice whether you are looking for a card that has no foreign conversion fee. I applied online which was quite fast, but unusual since I didn’t get a confirmation right away on my email about my application. It took days before I receive a response from Home Trust that my application is being processed. What a relief. Better late than never. Then came the long wait. It turns out I wasn’t the only one waiting. With the additional requirements and long wait (again), I highly expected to be approved. The Result: I was approved with a high credit limit. Still I intend to keep a utilization rate of 20% of the credit limit. A week after I’ve been approved, I received the card and activated it immediately. The next thing to do is to create an online account. This is when the interesting part began and might convince you or not to apply for Home Trust Preferred Visa card. This is the part that I wish I would have known before I apply for a Home Trust credit card. I was annoyed and somehow amazed that these advantages still exist on the age of Internet and online banking. You cannot change the address online. You cannot opt out of statement send through mail. You cannot change the PIN (for real?). You cannot download an APP. No PayPass (sorry no tapping). The huge disadvantage is not being able to change the PIN. Maybe you could if you forget it and have to call the customer service. Similarly, you have to call to update your address. It is like Amazon Visa because I amassed a lot of paper statements. There are more coming from Home Trust. Not looking forward to it. These pros are more like a bonus in having the Visa credit card. In situations that I can avail any of these services, I’ll gladly do so and hope that it wouldn’t be as tedious process as applying for the card. You can opt out of statement send through mail: Log in > Statement > Statement Delivery Options > Electronic. Visa Auto Rental Collision/Loss Damage Insurance program. Extra online security through Verified by Visa (pops up when shopping online). With every purchase, you get 1% cash back. The total balance will be credited to you in January. Emergency roadside assistance: 4 times a year, 24/7 in North America. Included service: free 5L gas delivery, tire service, winching, battery boost, and lost key lockout assistance. More features can be learned by reading the bunch of papers that came with the card. But I guess, with what you find out so far, you can decide whether it is the right card or not. No need to read the fine print but why not if you fancy to do so. I’ve been waiting for this. It’s a long wait but; finally, I received an email on how to change the PIN of Home Trust Preferred Visa. Step 1: Call at 1-833-263-2828. Follow the steps to select a new four-digit PIN. Step 2: At your next purchase, use the original PIN mailed to you. The new PIN will activate after the first transaction. If you are willing to put up with the long process and some drawbacks for a card that offers no foreign conversion fee and no annual fee, then go ahead. Otherwise, consider Rogers Platinum or Fido Mastercard. As for me, I’ll use it for now and take advantage of the benefits as much as I can while waiting for a better credit card. With the increase number of applicants may the service improve over time. 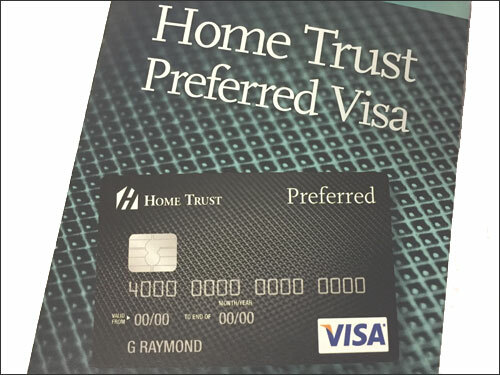 Do you have Home Trust Preferred Visa card? What other credit card with no foreign transaction fee can you recommend? I got a Home Trust Preferred Visa card last year to use primarily travel but, during two trips to the US, had some bad experiences with it. It worked in some places (e.g. Costco gas station) but it was declined at restaurants and grocery stores in Maui before Christmas, and in the last few days at a grocery store in Palm Springs. Speaking to Home Trust customer support (multiple times), they confirmed that the card was flagged for travel, and they weren’t seeing any transaction denied messages on the account. Thanks for the heads-up Geoff. I’ll use it when I travel to Asia just to test how reliable it is. But I’ll also bring a backup credit card and cash in case I experience the same issues. I’ll call Home Trust before the trip to make sure I’ll have no problem. I checked online if I could inform them that I’ll be travelling but this feature isn’t available unlike on my Rogers Platinum Mastercard account. “You cannot change the PIN (for real? )” Now you can (for real!!!) Call 1-833-217-8090. Once PIN is changed you have to insert card at an ATM/terminal. Enter OLD PIN at first prompt then use NEW PIN on subsequent transactions. Thanks for the information. I might try is one of these days. Some misinformation above. Yes you save the usual 2.5% bank markup on foreign currency conversion and yes you get 1% cash back on those purchases as well. So you are really gaining 3.5% over most credit cards. You can now opt for electronic delivery! I use my Home Trust Preferred VISA card for foreign transactions primarily. It saves me some money but the claim of no foreign transaction fee is misleading. They charge no foreign transaction fee above the ‘Visa exchange rate’ which includes a hidden fee of almost 1% over the true exchange rate. So the savings is closer to 1.5%, not the assumed 2.5% indicated in some posts. Hi Elio. Could you share to us how to find out the transaction fee and the discrepancy? The Home Trust Preferred Visa Disclosure Statement indicates that ‘purchases or cash advances in a foreign currency will be converted into Canadian dollars at the exchange rate set by Visa International in effect on the day the transaction is posted to your account, plus a 0% currency conversion charge’. You can google the Visa International exchange rate to find out more about it. The following web site indicates that the Visa International rate has averaged 0.87% above the posted spot exchange rate that you see in the Globe and Mail financial section or other business paper. So this means the true foreign exchange premium for most Visa credit cards is closer to 3.5%. Still a better deal to use the Home Trust Visa but it’s somewhat misleading to indicate there is no fee. I agree that the saving is closer to 1.5% but still a pretty darn good rate compared to other CC. Not 100% accurate anymore but top of my head, when I bought something for 45 US$, a quick google rate check would give it an equivalent of ~58 CAD$ and usually the HT rate is on-par to it and sometimes even lower. Same here Earl. I’ll use HT for overseas transactions. What I don’t like about it is that it takes ages for the transaction to reflect on my online account. Even if it has no tap feature for quick payment which can also be a good thing, I’ll keep it for now. PayPal has increased its charge when I transfer money to a person that’s why I hardly use it. It’s my habit now to almost always responsibly pay with credit card. Elio, to avoid this, simply have currency converted to CAD at time of purchase. Look up the Home Trust Visa Preferred forum on redflagdeals for a detailed explanation. The two big credit card companies charge the 1% fee over the “Globe & Mail posted rates” on ALL of their cards, then the banks in Canada usually tack on 2.5% on top of this. Home Trust does not. So, yes, the HT card is accurately described as a no foreign currency conversion fee card. Arrogance and obscenity are not tolerated in this blog. We all have opinions. Some worth sharing; others better left unsaid. At any rate, I think they’re fine. Not amazing but good enough. I’m also doing a trial of MBNA platinum because they charge a fee but give 2%. Rogers is also a great deal although the rates will change (lower) on May 23, 2018. (Already updated the post about Rogers Mastercard.) So the 4% cash back will become 3% but it has no annual fee since March 13. Still not a bad choice. Interestingly, I just found out that the MBNA cards are products of TD. Would love to know how MBNA Smart Cash Platinum Plus will fair compare to other reward cards.